One of the most critical periods prior to a race is what’s known as the taper period. In longer distance events such as marathons, Ironman distance events, ultra’s or stage races, a peak in training volume is reached. Then comes the time to reduce volume, recover, sharpen and arrive at race day fresh. This is known as the taper period. Many athletes put a lot of focus on the actual training and recovery aspects but completely miss the most fundamental aspect of the tapering period and that is nutrition. Another misunderstanding is the type of quality training that needs to be maintained until race day. Many athletes drop volume but then tend to neglect proper sharpening which involves speed and strength work. The focus of this blog is aimed at the nutrition required during the taper phase. The kind of nutrition you take in the 2-3 weeks before a big event can make or break your big day. There are a few areas where nutrition plays a very critical role when it comes to the taper period and very often these can get the better of an athlete. An athlete’s biggest fear is falling ill prior to race day. Let’s face it when we hit peak training volumes 3 weeks out from a big event our bodies are fatigued, immune system is low and we are very susceptible to infection. Even more so when we are exposed to children or closed work spaces on a daily basis. Contrary to popular belief athletes are quite weak at fighting illness during volume periods of training. Heavy volume training periods only mean one thing, cravings. An athlete requires food to fuel the body not just from an energy point of view but also from a recovery perspective. Many athletes also feel the need to eat because they deserve it after long hard sessions. Sugar highs and sugar lows causes appetite triggers and as disciplined as athletes are when it comes to training, they often fail when it comes to eating. There are also many athletes that worry constantly about weight gain and eat insufficiently to support the bodies fuelling requirements. Once training volume is reduced one of the toughest things to be able to do is shape the eating volume accordingly. Many athletes arrive at race day a lot heavier than they were during training and this is a common athlete mistake. A taper period is there for one thing. Muscle recovery and strength gains. It’s time to repair and recover and build. Remember training breaks you down, proper rest and recovery builds you up and makes you stronger. How you recover physically has a large dependency on nutrition not just reduced training and rest. The way you prepare your body from a nutrition perspective in the weeks and days leading up to an event will either make or break your fuelling strategy on the day. What you eat can either make your race fuel strategy very effective or completely the opposite and this is something you need to constantly have in mind as you approach the big day. With all of the above in mind, I felt it quite good timing to discuss these aspects especially with goal races approaching fast. Where your focus should be on a training perspective should be pretty well understood in terms of quality sessions leading up to the race. If you are not sure how to properly taper from a physical point of view towards your big race its best to consult a knowledgeable coach. The focus of this blog as mentioned earlier revolves around the nutrition leading up to your big day. With a few weeks out of your big day, it is not easy to focus on nutrition. You have to make a conscious effort to make the right decisions when it comes to eating and drinking, because whether you like to believe it or not, you can make a big difference on the actual day by taking the best nutritional approach. Eat with intent. Where to start is quite simple, just try to adhere to these few simple rules. Eating out firstly is not necessarily eating healthy unless you are completely sure of exactly what is on your plate. Just because it’s a grilled chicken breast or a fillet doesn’t mean it is basting free, not loaded with trans fats and has the correct nutrients. The risk of falling ill is one aspect as well as the issue of irritating digestive symptoms and then weight gain. Rather know what you are ingesting, keep it clean, keep it lean and prepare your own meals that you can ensure the nutrients you are taking in have a benefit and not a detriment. Cutting sugar intake is one of the smartest things you could possibly do in leading up to a big event. By sugar I don’t just mean physical sugar. I am speaking about the large anti-nutritious carbohydrate portions that most people are so emotionally attached to in the form of instant and processed cereals, noodles and grains. Rather take in carbohydrates which have excellent properties not just from an energy point of view, but also for immunity strengthening. The better your carb selection the stronger you will arrive at race day. Opt for carbohydrates which are nutrient dense, such as vegetables in the form of greens, spinach broccoli, Brussels sprouts, cauliflower, kale, Swiss chard and the likes. Reduce fruit intake to a bare minimum and stick to the immune boosting lower sugar fruits such as berries. Sugar just plays unnecessary havoc with blood sugar, and during the taper weeks it can only assist with contracting illness (the bad guys love to feed off sugar) and of course unnecessary weight gain due to roller coaster riding not to mention emotional highs and lows which play on pre-race nerves as well as sleep. Cutting it will certainly benefit you on race day. Depending on the type of nutrition plan you are on whether LCHF (low carb high fat) or HCLF (high carb low fat) Beach, Paleo, Vegetarian, Vegan and the likes ensure that your protein intake is of quality and not just quantity based. By this I mean don’t overdo the protein, eat according to your requirements. Opt for proteins which are leaner and measure your fat intake with known fat measurements. Consuming leaner proteins can also easier on the digestive system. If you are a meat eater sticking to chicken, turkey, fish and eggs can keep the digestive system happy, and for plant based eaters such as myself I generally choose a fair amount of vegetable proteins such as pea, rice, hemp as well as protein rich beans and grains. Keep the preparation clean and preferably keep dressings to an unprocessed form. Fats are so critical to any diet. They are an incredible source of fuel, and the only reason to keep fat intake very low is if your carb intake is very high. Try to get some good fats into the diet, Omega-3’s such as salmon, tuna, sardines, pilchards as well as the vegetable forms of flax and chia seeds make for excellent nutrient dense foods. One of the things I advocate in taper week is to up the MCT’s (medium chain triglyceride’s). They are fats that are not stored but more utilized as a source of energy and these are the types of fats you want in your system during a long endurance event. If you have never consumed MCT’s then don’t suddenly start as it takes time for the bowels to adapt and can cause digestive discomfort. I cannot stress enough the amount of fluid you should be consuming on a daily basis especially in the taper period. Try to aim for 30ml – 40ml’s per a kilogram of bodyweight, it might sound like a lot of fluid but it’s not at all. If you want to ensure you arrive at race day properly hydrated, in good health, topped energy levels and on top of the world then put some focus on your fluid intake. Whether in the form of water or herbal teas both are perfectly fine. If you are thinking in the form of fruit juice and coffee my answer to that is no as its high in sugar. If you are wanting a flavoured water, take a ¼ grapefruit and squeeze it into a liter of water, or a lime would be perfect. Sugar in fruit is very high and a fruit juice is just loaded with sugar. As for coffee check out the next section. Personally I am a huge fan of mineral loading prior to a big training session or a race. Water with mineral increases the rate of fluid absorption. I use 32Gi Hydrate and consume a a few glasses day in order to maximize fluid absorption. It works incredibly well. Caffeine can be a benefit or drawback. Caffeine is a mild stimulant that occurs naturally in a variety of plant species. There are people who view caffeine as a useful stimulant that increases ones concentration and awareness as well as many other physical traits. The important thing to remember is that caffeine affects each and every individual very differently depending on the amount consumed, the frequency of consumption, and a person’s individual tolerance levels. Let’s get to the facts. Scientific proof of caffeine and sports performance is actually pretty strong. One thing to remember though and this is from a health perspective. Caffeine is a stimulant and it does have addictive properties. In a healthy diet your consumption should be limited and health professionals will recommend around 0-7 cups of coffee a week as a limit. Unfortunately the majority of people consume a much larger amount. One thing is certain caffeine does stimulate and it plays with one’s emotional and energy stability. Stimulant drinks such as coffee are also known to be one of the biggest role players in a person gaining weight and affecting emotional stability. Another important consideration is that caffeine impacts the ability to sleep properly and this is a critical element of endurance recovery. Caffeine also causes a rise in acidity in the digestive system, and from a health perspective one should try to consume a diet that is more alkaline, acid of course can lead to issues especially in sport. Finally caffeine has diuretic properties causing loss of fluid, and the last thing you want to be is dehydrated during a sporting event. An athlete that consumes caffeine in excess is actually doing himself a complete disservice. So with all this negativity in mind, how can caffeine really help me as an athlete? Well there are two major benefits that caffeine has, the first is that consumed on its own without sugar has shown to raise the amount of free fatty acids available for use as a source of fuel. Fat of course is an incredibly powerful form of fuel and the more free fatty acids you have available for use in an endurance event the more you are able to benefit from it. There is one slight consideration though? That in order for this to work well, a person should be slightly caffeine intolerant, meaning at least not a lot of caffeine 7-10 days or more before and event, my recommendation is to cut it for longer. The second thing is the timing of consumption before an event. 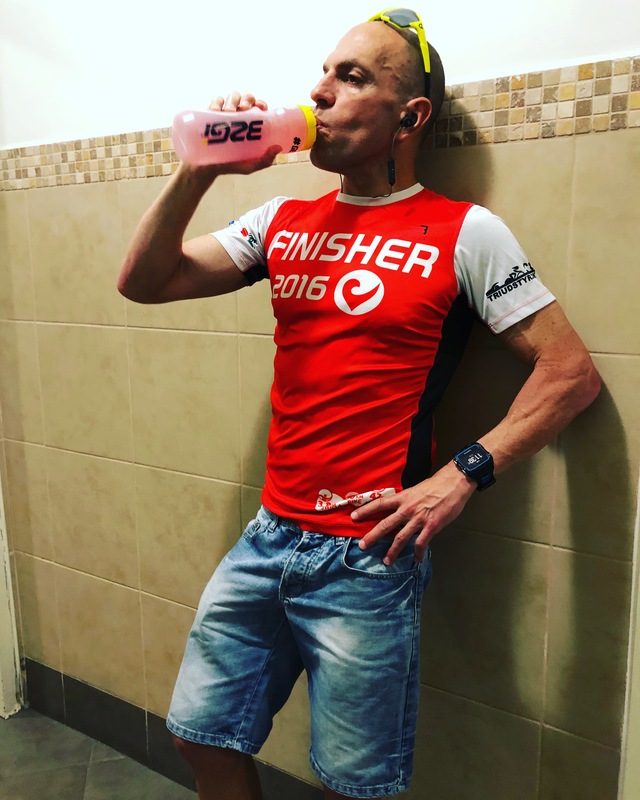 In scientific testing it’s been shown a consumption of around 1-2mg of caffeine per a kilogram of bodyweight around 3-4hrs before an event is best. It gives the body time to mobilise free fatty acids for use as well as being long enough before the event to remove the acid from the system, reduce the diuretic effect and of course negate the risk of dehydration. The second major benefit is caffeine for recovery. Yes, believe it. It’s been shown that having caffeine with a complex carbohydrate after exercise has shown to speed up the time taken for glycogen replenishment. Under testing it’s been shown to speed up the process by as much as 60%. As an example a rolled oats meal and a very strong espresso or two as a recovery. Thought you would like that one. Just remember to hydrate yourself consistently afterwards. As I often recommend one cup of coffee = two glasses of additional water intake to keep you properly hydrated. Finally, there is another major benefit, and this is the wake up & focus effect. In a major sporting event the mental endurance plays a very crucial role and the ingestion of caffeine has demonstrated the support of this and the ability to improve performance. The downside though is that an athlete who consistently takes a large amount of caffeine will not feel this affect as much as an athlete who refrains more from caffeine. One thing I have to stress is if you are planning caffeine intake on race day should trial it during training. It is important to know how much you require through the event hourly and how you respond to it. I would suggest around 30-60mg per an hour. However some athletes like myself go up to around 120mg or more per an hour in an endurance event. This is a very important mention. During your taper weeks you have a last few chances to check out your race day nutrition strategy. It keeps one confident and in check with what they are going to do on race day. The two aspects to look at are the pre-race meal, and this can easily be checked by getting up early eating a pre training meal and going out on a training session at tempo pace to gauge how you feel. The second type of testing is to fuel during a training session. This is also quite simple to do as all you need is at least 90min or longer and go out fairly fast (tempo) pace to test how your stomach and palate will cope with intake during the session. The other aspect’s to look out for are convenience form a carry and consumption point of view. The more you test your nutrition for an event over different durations and intensities the far better prepared you will be for the big day. Start months before and make sure you get it right. To conclude this little blog I want to stress the importance of nutrition during the taper weeks and in the days leading up to your big event. It is often overlooked but yet it plays a vital role. Follow these simple guidelines and reach your race day, feeling energetic, healthy and at the proper race weight to give it your all.